Before moving to England, I have to admit, I never understood the fascination of crumbles. They’re just mushy fruit with a soggy topping right? WRONG! Boy was I wrong. Here the humble crumble is revered for it’s soft fruit base and melting, crunchy topping. If made correctly, the contrast between the softness of the fruit and the crunch on top is heavenly. Variations are served all throughout the year and every restaurant (well, 90% of them) has one type or another on their menus. When I worked at Rock Salt, a popular brasserie in Plymouth – crumble never left the ever changing dessert menu and was always a popular choice. The thing with crumbles, is that not only are they actually delicious, but they are easy to prepare and very versatile. Use whatever fruit combination you like, experiment with different flavours or with seasonal fruit. The possibilities are endless. The crumble I’m showing you today is apple and rhubarb, and it’s go back for seconds good. Served with a scoop of vanilla ice cream, or custard, or whipped cream or all of the above, it’s comforting and perfect for a Sunday night. As you can see from the above picture. 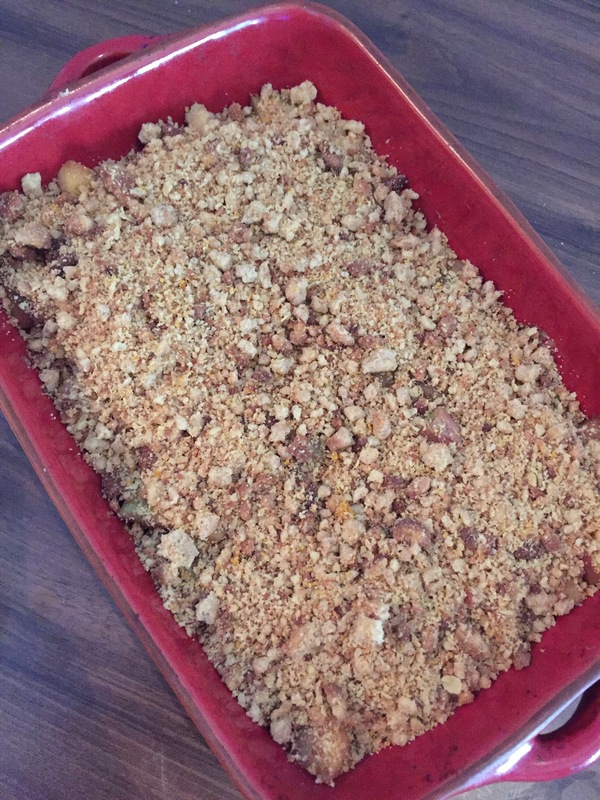 The list of ingredients for this crumble is very small, not only that you probably have all the dry ingredients in your pantry already. So no excuse at not giving this recipe a go. 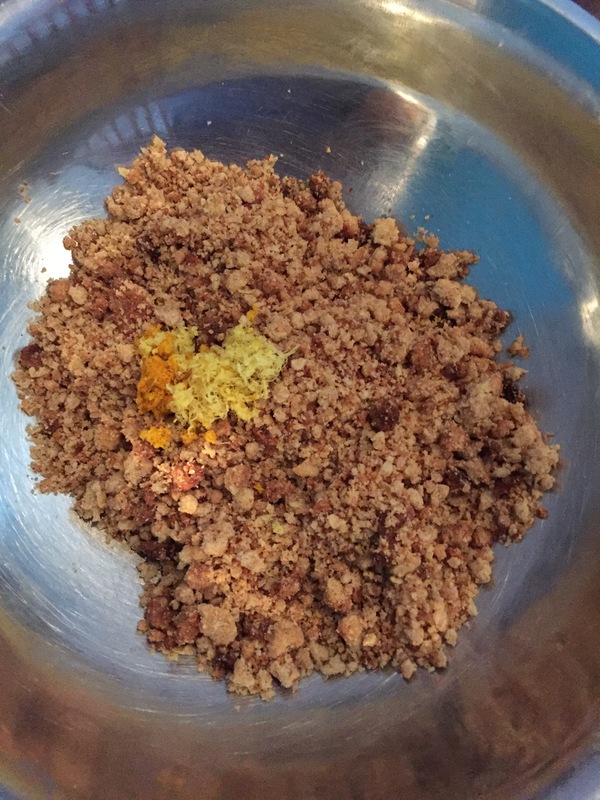 First start by making the crumble topping. Now traditionally, this is made without the addition of oats, however because I adore crunchy things, I toss it in. In a bowl, combine the oats, flour, caster sugar, ground almonds and cinnamon. Mix to combine, then add the butter. Rub the mixture through your fingers, mixing everything together until it resembles breadcrumbs or wet sand. Once the mixture is combined, try not to mix it too much, you don’t want to develop the gluten in the flour, add it a baking tray in an even layer and bake in a 400 degree oven for about 10 minutes or until it is crispy and golden. Allow the topping to cool and then crumble it until crunchy pieces. The mix in the zest of one lemon and one orange. Set aside while you prepare the fruit. Peel, core and cube the apples and add them to a pan with some sugar. An important note here is this: all apples vary in sweetness and tartness so taste you’re fruit first. You’ll have to adjust the sugar accordingly. 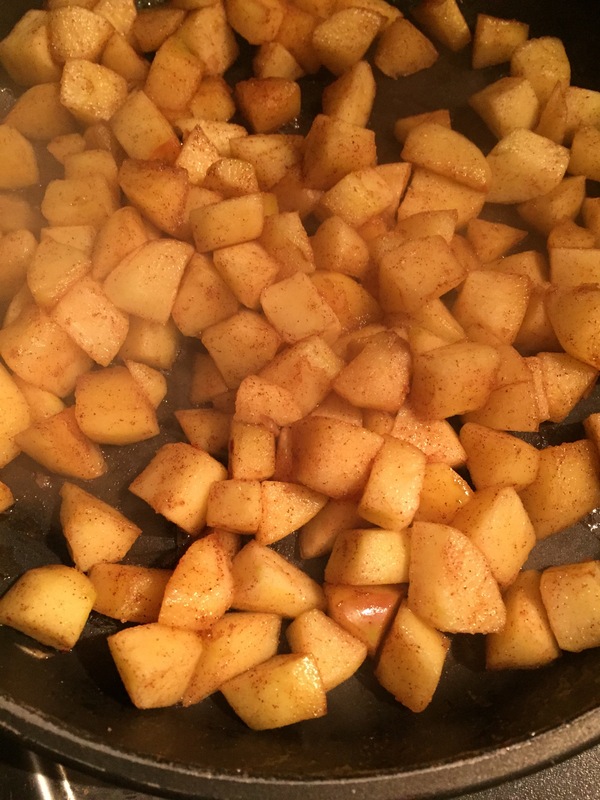 Add some cinnamon and cook the apples until soft and starting to caramelise. About 10 minutes. 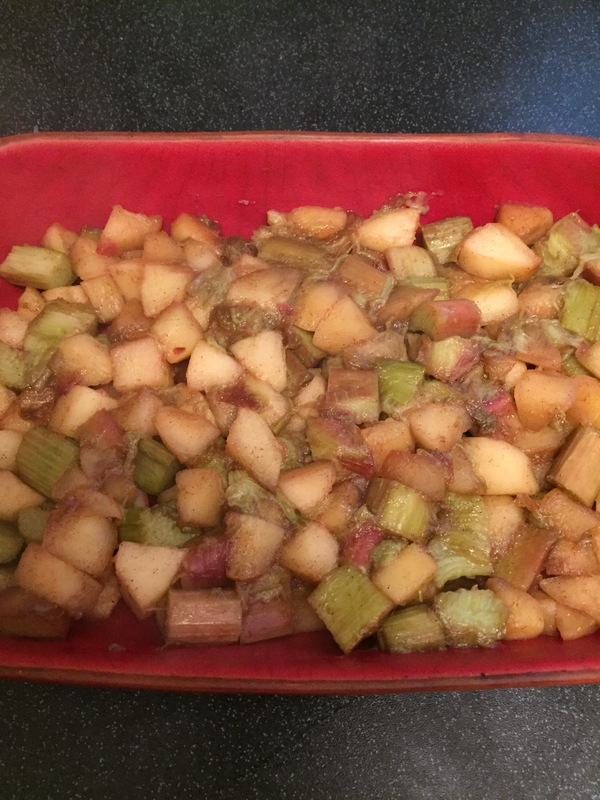 Once softened, toss in your sliced rhubarb. 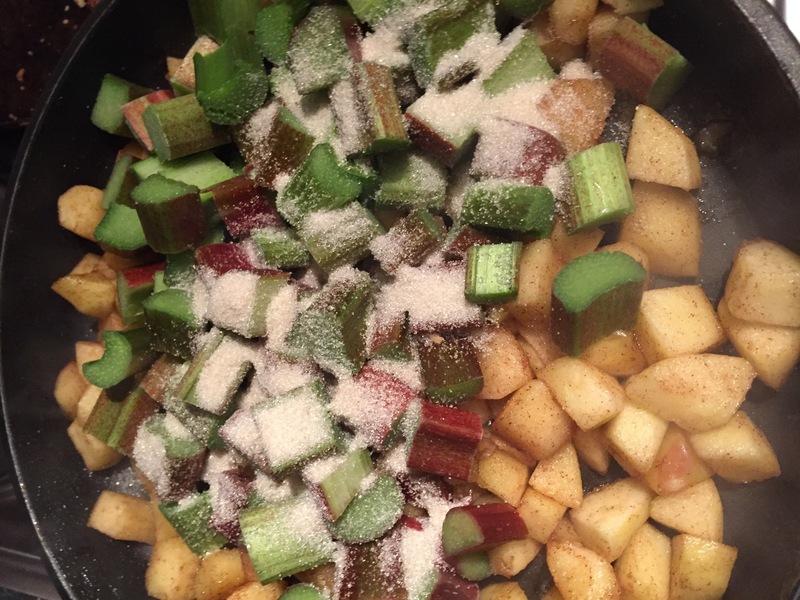 Add some more sugar and cook for a further 5 minutes until the rhubarb starts to break down. Once everything is softened, add the mixture to an ovenproof dish and allow to cool. Top with the crumble mixture and bake in a preheated oven for 15-20 minutes, until hot, syrupy and delicious. Preheat the oven to 400ºF. Mix the flour, oats, sugar, almonds, and cinnamon. Add the butter and rub through your fingers until you get a mixture that resembles breadcrumbs or wet sand. Spread evenly on a sheet pan and bake for 10 minutes until golden brown. Remove from the oven, allow to cool, and crumble with your hands. Stir in the zests and set aside. 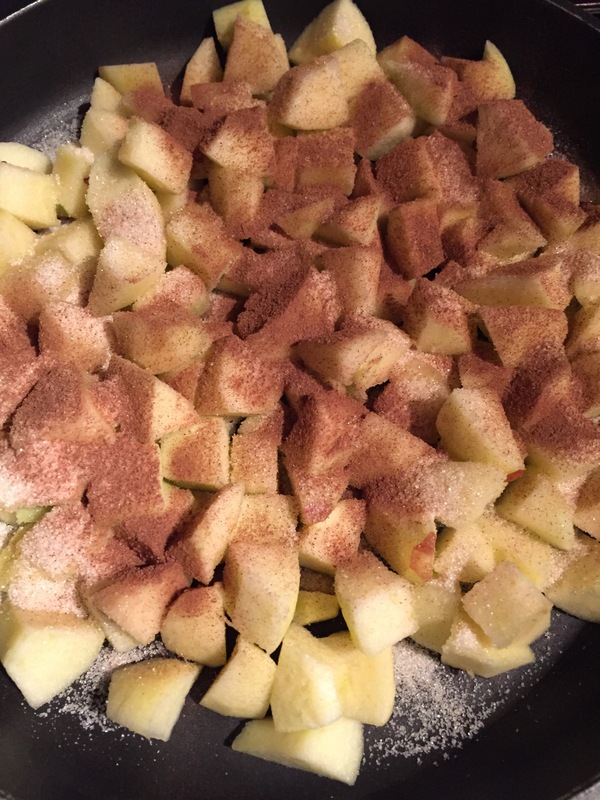 Add apples, cinnamon and half the sugar to a pan and cook over medium low heat until the sugar has dissolved and the apples have softened and started to caramelise. Add the rhubarb and remaining sugar and cook for a further 5 minutes until the rhubarb starts to break down. Add the fruit to an ovenproof dish, top with the crumble and bake for 15-20 minutes. Serve warm, with a scoop of ice cream, custard or whipped cream. Yum! It’s definitely crumble season but I have yet to make my first. I always put oats with my topping and can’t imagine a crumble without it. It just balances it all out somehow.